While The Highway Code advises not to park against the flow of traffic, it’s a legal manoeuvre that’s carried out by a lot of drivers on today’s roads. You might use it when pulling over to nip into a shop, post a letter, deliver a parcel or even if you live on the right-hand side of the road. 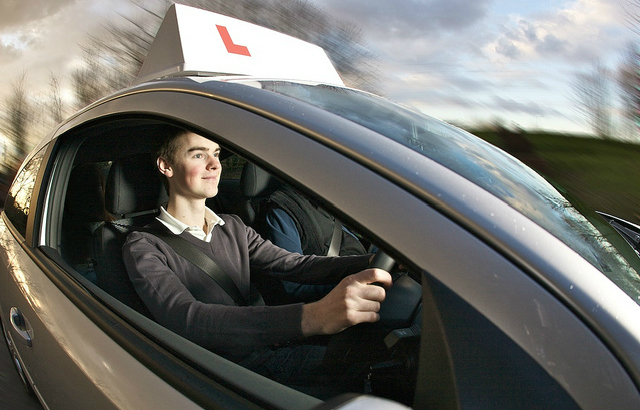 So, it’s important learner drivers are trained to do it safely. All your pupils will need to be prepared to pull up on the right when safe to do so, and then reverse. If a vehicle pulls in front then the exercise will continue. If a vehicle pulls in behind and stops your pupil from reversing, then the exercise will stop and another manoeuvre will be carried out later in the test. We understand you’ll need to use a car park to let your pupils practise this manoeuvre. We know you’ll be considerate of the car park owners and their customers by varying the car parks you use and moving on promptly. Research shows that 52% of car drivers now have a sat nav so it’s important that drivers can use them safely. Using a sat nav on the test means that examiners will be able to better assess how pupils drive independently whilst dealing with distractions. Before the test starts, the examiner will secure the sat nav on the car dashboard using a special dash mat. During the test, your pupil won’t need to touch the sat nav. The sat nav screen will be on throughout the test but won’t show directions until the independent driving part of the test, when the examiner will activate the pre-loaded section of the route. The sound will be used for the independent driving part of the test unless your pupil asks for it to be turned off. Our examiners won’t be looking at whether your pupil can set up and use a sat nav. They’ll be assessing how they manage the distraction while driving. Your pupils can practise with any sat nav, including using a mobile phone as a sat nav. As long as the phone is suitably mounted and your pupil doesn’t adjust the phone whilst driving, it’s not illegal. We’ve updated the ‘show me, tell me’ questions that your pupils will need to prepare for from 4 December. The main difference will be that one of the show me questions will be asked while your pupil is driving. But, the main topics have stayed the same. Using a sat nav on the test will also help to introduce better routes and different types of roads. Currently we’re restricted to carrying out the independent drive on roads where there are suitable road signs. This is often in urban and built up areas. Using a sat nav means we’ll be able to conduct more of the test in more challenging driving environments such as on rural roads where there are fewer traffic signs. Make sure you’re signed up for email alerts or follow us on Twitter and Facebook for the latest updates. Including Sat Navs on a test is a poor decision and not like real life driving as most people only use Sat Navs when going somewhere they don't know. Most peoples driving is around town, to work/school and to visit places or people they know therefore in a place they have been before. No need for a Sat Nav. I am aware that a lot of ADi's have expressed this to the DVSA team that developed this but weer given excuses like "my daughter uses a Sat Nav around town all the time". Please do not let this decision be based on what 1 examiners daughter does. Changes needed to be made and most of them I applaud but not this one. Sat navs are a distraction in real life so it's vital we all know how to use them safely surely. It's real life situations we're talking about here and everybody's got one and everybody uses them. Move with the times. What about motorway driving, that should be included. We worked with the British Deaf Association and showed them a demonstration of the new test when were trialling it. Their feedback was very position and agreed that introducing a sat nav made it easier for deaf drivers. There’s link in the blog to a good write-up on the British Deaf News website with more information about the impact the changes will have on deaf drivers. I feel there will be carnage when there is a significant hard frost or fall of snow as most drivers today have had no experience of really slippery road conditions. I would like to get my two teenage granddaughters (1 of 19, who has passed her test, the other 17 and just started driving lessons) for a session on a skid surface if this is possible? Will the speed be displayed on the sat nav on test? The candidate should use the car's speedometer as that is the only speed that will be used during the test. During the new driving test manoeuvre to pull up on the right, you have mentioned that if a car pulls up in front then continue with the manoeuvre and if a car pulls up behind abandon the manoeuvre. What happens when this happens on test and the candidate cannot see sufficiently to move away safely ie car in front and car behind? Is the examiner then able to advise a candidate when it would be safe to move away from the right hand side of the road due to lack of vision ahead? The examiner will give the necessary guidance to assist the candidate when pulling away if their view is restricted by vehicles pulling close in front or behind during the time it takes to complete the manoeuvre. If a vehicle pulls in behind after the manoeuvre is completed, the candidate would be expected to make the necessary observational checks before moving off. They could benefit from moving forward to get a better view before moving back across to the left. With the pull up on the right, the candidate will be asked to pull up on the right when it is safe rather than at a safe place. This is a manoeuvre rather than a normal stop exercise and the location that is chosen by the examiner will allow ample opportunity for the candidate to select when they think it is safe to move across to the right. If it becomes apparent that the opportunity to pull up somewhere suitable no longer exists, for whatever reason, then the examiner will control this situation with the possibility of aborting the exercise and choosing another location later in the test. The examiner will give the necessary guidance to assist the candidate when pulling away if a vehicle pulls in extremely close - either in front or behind. I still find it laughable that you are holding to this more reflective of real life line. Are you going to be performing these manoeuvres where the real danger of them is tested? I doubt it. This then in fact makes them no more relevant that the current manoeuvres. The same instructors who currently train these things anyway will continue to train them and the ones that don't wil stop teaching turn in the road and reverse corner. If anything the new manoeuvres are easier that the former ones as a result of the conditions under which they will be performed. You also as yet have not answered the genuine issues raised about the car parks available and the problem of practicing the pull up on the right at night, as this is against the Highway Code and also in the winter when many learners will not be able to take lessons in the light. The getting to more dangerous roads statement is questionable at best especially at certain times of day and a lot of these roads around tested areas are sanitised any way by lowered speed limits, we all know that this could have been better achieved by increasing the length of the test or making post test training mandatory. Other areas that are already rural the test routes alredy cover these types of roads so there will be little change in these routes, as there are little available roads to change them too. The satnav element will be negated in no time by the fact that some instructors will track their vehicles, as they alredy do and find out exactly what routes you re using and teach them, not the ability to use a satnav correctly. If we are going down this route then why not test parking safely and with vehicle sympathy on the kerb?, this is not illegal other than in London. Parking at junctions? Taxi turns? Will the rules on mini roundabouts be relaxed on test to allow for the large percent of real life driviers that just drive straight over them? Or the same about the give away rule, which millions of occurrences a day happen where someone pulls out affecting the speed and direction of others greatly? Turnuing with out a signal where clearly there are others who would benefit? Attacking junctions aggressively and cutting corners or forcing other to yield in meeting situations? Failing to give way where safe to buses? Over taking right turners on the kerb? Tailgating? All of these happen in real life all day, every day, even though they are contrary to the Highway Code but not necessarily "illegal" are these going to be accepted on test? I have and always will fell that testing these new things will only validate poorer practices, not reduce the KSI stats as you purport but that real change will cost votes and cause issues for the government that can be postponed for 5 to 10 years whilst we wait for the proof that this change has worked or not, even though there is currently no proof that it will. We routinely review the content of the driving test. We want to ensure that it reflects real life driving so that new drivers are prepared as best as possible for driving on their own. We worked with the driver training industry and other interested bodies to identify these beneficial changes that reflect common driver behaviour. Just as there were lots of questions and concerns when we originally introduced the independent driving part of the test in 2010, we know there'll be questions and concerns about these changes. Please do leave your questions here so we can get back to you with any information that you need to help you prepare for the changes. The elements of the test, including the increase of independent driving from 10 to 20 minutes, has been designed to transfer more responsibility to the candidate, making them better equipped to drive alone and think for themselves on the road. The current practical driving test spends a disproportionate time on low-risk roads, such as housing estates, largely to access locations to carry out manoeuvring exercises. The updated manoeuvres, whilse testing the same skill set, are more representative of what a new driver will encounter in their everyday driving. While conducting the test on a variety of different roads, the changes to the test will allow the examiner to access higher risk roads, where statistically new drivers have the most crashes. Using a sat nav during this section of the test will encourage a wider range of training, not only preparing new drivers to drive safely on rural roads, but also to manage distractions. Good afternoon. Most of this is brilliant. But . the Police. And i do work for them. still treat things like cameras and sat navs as illegal in vehicles. Like self parking. So it would be best to make this legal before doing this new test. But if you want real life. Then go out and look at drivers. They are not just following routs on the sat nav. they are playing with it! Like with phones i see this every day! it fact. You can check this out. More accidents are now caused by sat navs than using mobile phones. As stated on numerous occasions by news channels from a lot of leading road users companies. So please look again before doing the test. I am a CPC holder. The old type. I used to trane my drivers. It took 20 mins. And after that had hardly any accidents at all. I also had a question for manufacturers that they looked on as crazy. But it dropped my insurance down to around £750 per year Fire and theft. Where as the courier company with the next lowest price was around £2500 per year. The question was this. What is the impact speed of the bumper before the headlights crack. If it was not 40 mph. Then i am not interested! And that is true. I do not take the 30 mph on a solid block as any good at all. I use actual crashes for information. I hope that you can check this info out. One of the show me questions is raising concerns with some instructors. "When it's safe to do so, show me how you'd operate the horn"
If the driver feels that it is not a suitable area, i.e. pedestrians that may be alarmed, is it acceptable to simply state that " I'd use it by pressing here but I don't wish to alarm anyone unnecessarily "
The examiner will ask this question in a suitable location to allow for use of the horn to be demonstrated. The new test will not result in safer drivers on our roads . There was so much that could have been done and I, as an ADI , am extremely disappointed that this is what has been decided . We are now being asked to teach practice that is not the best practice , therefore , condoning it as good practice .the removal of the T.I.R is a mistake . Can't wait to see pupils going the wrong way with sat nav and examiners having to talk them through turning the car round as I can guarantee that not all instructor s will continue to teach this . Many teach purely to pass the test . I agree a lot of people will use sat nav but many won't .i also feel it will make them lazy drivers as it takes away the need to watch for and read signs and road markings . This may still be taught but more focus will be on the sat nav . I have too many objections that I won't even bother listing them all as it won't make a difference . It is a backward step in my opinion and it just makes me feel angry . I know I will need to get on with it and I will as I have no other choice . Yes I think most things have been covered would like to add when night driving how to alter the interior mirror to stop dazzle from behind? I try not to be anti-DVSA as a matter of course, but you really do shoot yourselves in the foot sometimes. A huge amount of money has been spent on "the trials", and it stands to reason that no one at DVSA is going to turn round as say it was all wasted, and it was better the way it was before. Using a satnav I can live with. Adding new manoeuvres that "reflect real life" I can also accept (though I wonder at what point during the latter part of the 20th Century this might have become true, and why it has taken until now to try and "reflect" it). But removing the turn in the road and corner reverse is just ridiculous - they are far more valuable than the new ones. Why couldn't ALL the manoeuvres be included in the syllabus? You're only going to test one of them anyway, so it's no skin off your noses. But it would make sure that they are taught. Up my neck of the woods, the first time bay parking was introduced to a test centre (none had done it previously) there was a mass boycott by instructors who didn't know how to teach it in favour of other centres. None of them had taught it before because they knew it wasn't going to happen on test, and pupils weren't happy paying for it to be taught if it wasn't going to help them pass. Quite frankly, a lot didn't KNOW how to teach it, and instead began telling pupils that the other centres were "easier" - a myth which persists to this day. And that is EXACTLY what will happen when you remove TIR and corner reverse. Some ADIs - and by no means all - will carry on teaching it. For while at least. Newly-qualified ADIs won't touch them after their first few scuffles with pupils and parents, and the threat of lost income. These skills will gradually disappear. If little Dwayne or Kylie misses the turn off for McDonalds at 11.30pm on a Friday night, I'd feel much safer myself if I thought they at least KNEW how to turn around safely, and their enhanced ability to park in McD's or fling the car across the opposite side of the road and stop outside the Co-op would not console me even a little. It's dumbing down, plain and simple. The examiner will ask the candidate to choose either left or right reverse depending upon factors such as one-way traffic systems in car parks. Corrective shunts willl be allowed if required. It's about the candidate's control, accuracy, and observations. Will the emergency stop still be used on new test. Yes, this could still be asked by the examiner during the test. I must admit having driven for 35years. 18years as a rep. Up and down the country using "my nose" and paper and road maps etc. And 15 years as an ADI. I have been a very reluctant participant in this NEW change? Feeling sat nav to be UNNECESSARY!! And an additional cost to my business as i have never needed or wanted one. Be doing sat navs anyway as it is in there ? I am concerned about how you refer to the changes as being 'reflective of how drivers drive today'. We/the DVSA are the standard bearers of how drivers should be taught and perform on the road within the parameters of the Highway Code. We teach our pupils to minimise risk yet you are including a high risk manoeuvre that has come about by allowing the public to dictate how things effectively should be done. By that logic everyone exceeds the speed limit on dual carriageways and the motorway should we then teach them how to do that? Of course not so why then involve a manoeuvre that could potentially create more problems on the road? Wouldn't the new test be best improved by involving more important things such as motorway driving? The answer to the tyre condition is wrong. Cuts are allowed, tread is measured on the centre of the tread not the tyre breath. Some tyres have a bulge at the seam. Are the revised manoeuvres as well as or instead of the manoeuvres already carried out? ( are we finally getting rid of the turn in the road which causes so many delays to other road users) And will pupils still only have to perform one of the manoeuvres during the driving test. Yes, the revised manoeuvres are instead of the old manoeuvres - pupils will no longer have to perform a turn in the road or reverse around a corner. They will still only have to perform one manoeuvre per test. Does the examiner guide the pupil out if a car pulls up behind them when parking on the road facing traffic and they are unable to reverse the 2 car lengths back? When you say the deaf society agree this is ok has now they have a visual aid to look at but this now takes there eyes off the road is this really safe? And dyslexic pupils struggle with the terms of the sat nav is this a plain turn left or turn right or does it give the details of all the road names etc and what distance will it give the directions ? If the candidate has been prevented from reversing back, then the manoeuvre has not been completed, so the candidate will be asked to drive on and another exercise will be carried out later in the test. Introducing sat nav to the test allows for all candidates, including deaf, dyslexic etc to be trained in the appropriate and suitable use of such devices. This will better prepare them for when they drive independently after passing their test. Examiners are trained to make any necessary adaptions to ensure all candidates needs are taken into account. I have been an A.D.I for over 40yrs Car L.G.V. & P.C.V. I am giving up my licence this year due to this change of testing. Parking on the right & using sat nav's.!! Most people will not park on right as this is dangerous. Who would use a sat nav to go to the shops. The turning in the road is a manovour for control and observation this is required at all times during driving. The D.S.A. needs to get in the real world and not listen to people who have never done the job. Examiners have the easy job it is just "yes or know "
Will bay parking only consist of forward parking or will reversing into the bay also be required? Will parallell parking still be a part of the test?Thank you. Bay parking will be either driving forward into a bay and reversing out or reversing into a bay and driving out. For driving forward into a bay, we will only use car parks where there is no restriction for use. For reverse parking in a bay, we will only use test centre car parks. Parallel parking is still one of the three manoeuvres included in the test along with bay parking and pulling up on the right. yes I have to agree it is a legal manoeuvre , pulling up on the right side of the road. However,,..,, with head lights still in use, ( wrong ) please put them on to side lights or off, and remember leaving a car at night against the flow is hazardous as rear reflectors will not be seen in correct lane. Further in addition to my disgust of this practice, if I need to nip to a shop I go around and come with the flow and park safely, persons are 99 percent more courteous when with the flow. and finaly we signed up to an agreement of lowering emissions, and holding two lanes of traffic up to complete that manoeuvre is hardly encouraging. And to teach learners bad habits is a shame on you. It's disappointing that the candidate cannot refuse to use satnav on the test, as some people, like myself, do not trust satnavs and hence won't use them in real life. Surely they should have the option of being one of the 1 in 5? However, if they have no choice but to use DVSA's satnav on test, I believe the sound should always be on, with an option to have the screen off or turned away, (except for hard of hearing candidates). If the sound is off, the screen would be a severe distraction, possibly more of a distraction than glancing at a text! Beyond reasonable doubt the sound being off will compromise safe driving for life! Cat B driving test is far too easy and far too short, Might as well sit in an office and do it all on computer . DSA needs to look into the MOD cat B test passes I am not allowed to comment but most of the test pass drivers are dangerous and do not know the basics needed to avoid accidents. With regard to the forward bay park exercise i have several concerns but primarily what if during the exercise the pupil hits another vehicle what action will the examiner take pkease dont say it wont happen as on more than one occasion my pupils have been allowed to hit a metal post outside the knaresborough test centre. Secondly how long do you think supermarket or similar car parks will put up with learners constantly been in their car parks when they are meant for shoppers so when they start putting no learner signs up what will you do then. Driving examiners are trained to take control in these circumstances and will prevent any contact between vehicles. The safety of customers, the general public, and property is a high priority. In the highly unlikely event that this did occur, the examiner would deal with it in the most appropriate manner. Leaving a note may be a suitable option at that time. In answer to your second point - we're only going to use car parks with no restriction for use for forward parking in a bay during the test. For reverse parking in a bay, we will only use test centre car parks. We've also liaised with the British Parking Association (BPA) and other car park owners/operators and produced a guidance poster for all driving test centre waiting rooms. This will help you choose car parks to train your pupils in. When pupils are taking lessons and the driving tests they will conform to their instructors and examiners way of driving its when they are out on there own or with friends they may compromise there own safety and other road users. Hi the only problem I can see is car parks. The council will not let driving school use local council car park. They are starting to fine driving schools.this can't be right. You DVSA want pupils to learn about car park. But local government is banning school. DVSA has liaised with the British Parking Association (BPA) and other car park owners/operators and produced a guidance poster for all driving test centre waiting rooms. This should help you choose car parks to train in. Some of this makes no sense! At my local test centre Independent Driving is far from being done on quiet streets and in some cases includes joining a dual carriageway. Driving forwards into a bay could still be done at a test centre. Are you suggesting pulling up on the right on busy roads? Seems a wise suggestion. Most drivers I know at some stage use turn in the road or left reverse but these are being debunked. No logic. You could easily get someone to pull up on right then pull away and still include these. What exactly is the challenge of reversing in a straight line compared to what they are replacing. As for Sat Navs, the reasoning seems flawed. Surely it's not a case of how many people have them (probably closer to 100% if you included google maps on smart phones) but the question is how many journeys do people use them on? If it's just about distraction then have conversations in the car, play the radio etc. If safety is a concern make sure that rural routes are included on every test as well as, where geography allows, dual carriageways. If that means making the test longer then so be it. How will the sat nav be powered. Will the examiners expect to use the 12 v power supply from cigarette lighter output? What if the car either doesn't have a 12 v charge point or it's being used to power perhaps auxiliary speedo.? An external powerbank will be plugged into the sat nav itself for further power supply. So is the reverse around a corner, parallel parking and turn in road no longer required? Parallel parking is a real life manoeuvre surely? The ‘reverse around a corner’ and ‘turn-in-the-road’ manoeuvres will no longer be tested, but should still be taught. John, the ex-manoeuvres may well be bracketed under "SHOULD be taught" heading, but I can assure you that they won't be if there's no chance of them being tested for. Many instructors won't touch them from the outset, and many more will follow suit over the next couple of years. Many pupils (and their parents) won't want them taught if they're not being tested for because they believe it "costs them money". This will be especially true in the sorts of locations where driving attitudes are already poor. Instructors - and especially newer ones - are not going to risk losing work by arguing that with these parents. The only way of making sure they ARE taught is to have them on the syllabus, and potentially testable. Why we feel it's a good idea to contradict the Highway Code and actively encourage new drivers to park into oncoming traffic I will never understand. pulling up on the right. i disagree with. for vans and lorries find. to reverse. not cars. it is illegal at night and should be during the day. as the driver is half way out into the main road before he or she can see if anything is coming . dangerous manouver. park only on the left. if you want to park on the right.plan your route. go round the block. find some where to to turn around to come back so you park on the left. not all sat navs are the same. some are better than others. As many driving instructors agree the parking on the right side of the road is potentially a dangerous manoeuvre. It is particularly more hazardous at night time when your headlights will be shining into the faces of oncoming traffic . To encourage a pupil to perform this manouvre is wrong . When you see a driver trying to pull away from the right hand side of the road and they are on their own in the vehicle they have to pull out a long way for them to see when it is clear .It is dangerous .Also the turn in the road should be maintained as it is probably one of the most common manoeuvres a driver performs . Will the Bay Parking still be carried out in the test centre car park or will it be in a public or private car park, e.g. Supermarkets? Having in mind most supermarkets now have number plate recognition cameras which then apply a fixed penalty if the vehicles returns during a certain period. The vehicle on test could have been practicing in the same car park prior to the test. Will the instructions for pulling up on the right be given when the vehicle is stationery or on the move (Or via the Sat Nav)? For forward parking in a bay, we will only use car parks where there is no restriction for use. For the reverse parking in a bay, we will only use test centre car parks. The instructions for pulling up on the right will be given while the candidate is driving. What will happen on show me tell me questions if the candidate has only one hand? The examiner will make sure to ask an appropriate question. The instructor could approach the test centre prior to the test to explain how they have been dealing with this during training. You will only improve driving standards by confronting post test driving. Constantly messing around with the test will not prevent people from passing through luck rather than ability.I have carried out my own survey amongst learners since the beginning of the year, and not one has felt sat navs on test will make any difference. The right reverse takes us back to when I first began, over 38 yrs when it seemed rather dangerous even then. Post test must be faced up to at some stage, but no that would be too upsetting for the wider driving public. Thankfully I am retiring soon, I do feel sorry though for those few Instructors who try to teach to drive and not just hope to pass a test. Yet as long as the DVSA continue just like the DSA, luck will determine who passes, with examiners trained to tick boxes.With no experience of teaching and unable to assess what really is a competent driver. I appreciate my comments will fall on deaf ears. Not sure or convinced if there is a safe way to use a sat nav ? Just another distraction from watching what you should be looking at !! I was involved in a serious accident last Sunday when a driver turned right across my path!! Driver of the offending vehicle says sorry I was following the sat nav 3 people hospitalised 2 cars written off. I agree with the principles of updating the test. I am concerned about the car park aspect of training pupils, supermarkets, hotels, shopping centres etc are all private land whereby doing such training is not only an inconvenience to members of the public but is trespassing. There are going to be scores of instructors trying to find facilities to teach this manoeuvre and I think we will very soon see 'no driving tuition ' signage at car park entrances. I would appreciate your realistic suggestions. We've liaised with the British Parking Association (BPA) and other car park owners/operators and produced a guidance poster for all driving test centre waiting rooms to help you train your pupils for bay parking. After pulling up on the right, if someone pulls up behind, how does a driver move off safely? Where will the forward bay park be conducted? How exactly will the satnav be succured? If a vehicle pulls in behind after the manoeuvre is completed, the candidate would be expected to make the necessary observational checks before moving off. They may benefit from moving forward to get a better view before moving back across to the left. Forward bay parking will take place only in car parks where there is no restriction for use. Reverse bay parking will only take place in test centre car parks. The sat nav will be mounted in the centre of the dashboard if appropriate. Window mounting will be a secondary option. I have seen conflicting information that some of the traditional manoeuvres will be dropped from the new test. This blog does not explain which will go and which will stay. It makes sense that we still teach all manoeuvres but it would be useful if ADI' s could tell their students exactly what to expect. Are you contacting the owners of the nearby car parks(with relation to the test centres) informing them that a driving instructor vehicle could be using the car park for test purposes? I have been asked on numerous occasions to 'move on and leave ' by employees of the car park owners. How would this affect the test of this was to happen? We'll use a wide variety of car parks for the bay parking exercise, such hotels, retail parks and supermarkets. Our driving test centre managers are finding the most suitable car parks for each test centre. We're also talking to national car parking organisations to agree a joint approach to using car parks for this part of the test. Where can we obtain the preloaded route for the sat nav. We don't publish driving test routes - and we won't be making the preloaded sat nav routes available. This is to make sure that the driving test reflects realistic driving conditions. most car damage in a supermarket car park is caused by drivers driving into a parking bay and then not being able to manoeuvre out. Why not make them reverse park rather than forward park? We decided to include forward parking in a bay because we wanted to include real-life scenarios. Many people in supermarket carparks drive forward into parking bays so it is easier to load shopping. Some candidates will have to reverse park in a bay on their test - it's one of two variants on the manoeuvre we've included in the test along with forward parking in a bay. Missed opportunity to reduce the number of faults allowed. It is still staggering that a student can make approx one fault every 3 minutes and still pass. This is allowing a ridiculously poor level of performance to driv e on the road legally. Faults permitted should be reduced to single figures! are the DVSA aware that it can not find postcodes in rural areas? Thanks for an informative blog which highlights alot of positive points for the new test. I can see how this will be very useful for deaf drivers and make the test for the examiner alot easier to deliver. I do however find the mention of 20 minutes independant driving somewhat confusing. If the sat nav is giving full directions for the whole 20 minutes, how independant is it? Also, if 20% of candidates are following traffic signs like the current independant drive, is that not considerably more dificult? Years ago when independant driving was introduced, i could see a real benefit to candidates not being told every direction and having to plan following signs. I just can not see the difference between the examiner delivering the instruction, or the sat nav, therefore see this as an easier test to the current one. I'm also very interested to know how we will manage using the car parks for the forward park exercise as we are already having car parks fitting cameras in preparation. If it were just examiners using them, i wouldn't worry but instructors will be using the same car parks as us from 6am until 10pm, and with the best will in the world,people will tire of that. A sign in the waiting room will not stop the use of these car parks for practice. I have not been part of the initial trial so look forward to my training where i'm sure the points raised will be answered. At present, I show my pupils a newspaper cutting entitled, "Sat Nav Sent Young Driver To Her Death Down Wrong Slip Road", should I stop doing this? I tell them NOT to use Sat Navs, but plan longer journeys using a Road Atlas, and read Signs Markings! Thanks for this update. I assume that during the 'Show me' section "when it's safe to do so" also includes the option for the candidate to reduce risk of distraction by waiting until the vehicle is stationary. Also, the commands or requests aren't actually "questions" and this new test is a great opportunity to revise the way they are perceived. In creating a bank of "questions" these are generally perceived and taught as something to learn by rote before the test, when in reality they should be actions taken throughout the learn to drive course. Finally, 'Show me question 4 - why does it ask the candidate to show how to SET the rear demister? There are of course various settings for the front demister but only on/off options for the rear. Why doesn't it simply ask them to show me how to switch the rear demister on and off? Parking on the is illegal in Australia and cars used to be towed away in Germany. If we really want to make the roads safer then why not make parking on the right facing oncoming traffic illegal. Speaking to the minister for transport would be helpful to make this happen. I believe that the changes are beneficial However, to reduce accidents more consideration must be given to restricting young drivers. I worked as a paramedic for twenty years and I've attended far too many RTC's, the majority of them - young people with little experience and an attitude of immature invincibility. 4. Insurance companies could do more to reward safe drivers. e.g.. Black Boxes, incentives for Pass Plus, Incentives for the IAM test. it will be interesting to see how these changes take place.I will have to go on every test to see how they are implemented.Can I make a suggestion to have an open day at specified Test Centres showing a Video on the New Changes and ask Questions at the End of the Video.It will be up to the Instructor to turn up.Many Thanks Have a Good Day Nath.A.D.I 05840. How will the new sat nav equipment be powered? Are they battery powered? My power socket is already used by security cameras which I do not wish to be unplugged. There is not room at my power outlet for a splitter to enable two plugs. My concern is with the stopping on the right. If, having reversed back the required distance, a large vehicle parks in front will the examiner be allowed to assist if the view ahead is restricted. If not, this could be very dangerous. The examiner will give necessary guidance to assist the candidate when pulling away if their view is restricted by vehicles pulling close in front or behind during the time it takes to complete the manoeuvre. Whilst change can be good it's only good if it improves standards we will now have to teach against the recommendations of the Highway Code just because that's what's people do! Even though they shouldn't!! It is a shame we have put in the test the right hand stop as this is clearly a issue with road safety as it is a blind area even when looking around. In advanced driver training we are requesting all drivers reverse park so again it a shame we have not stood by what is safe. The Sat nav is good but we do need to be able to see the same type used to learn as will be on test. In the 1 in 5 tests that are conducted following signs will this be 10 or 20 minutes and may it include an old style manoeuver ? The independent driving section will still last 20 minutes for those 1 in 5 tests where the candidate is asked to follow traffic signs. All car driving tests will only include the updated manoeuvres from 4 December 2017. I am not happy about the driving forwards into a parking space. We are giving in to the masses instead of improving their driving. Kids espenally are harder to see. I presume the "show me" question whilst driving would be a slowing down hand signal, or turn left, or similar as I fail to see how they can show you something whilst driving! They include things like showing the examiner how you'd wash and clean the front windscreen. I'm all for moving with the times, however if we're teaching Learner's to use modern car technology, then surely we should include things like reversing cameras, reversing sensors, Cruise control, push button parking brakes, etc. I like to say you guys did a great job . Point of changes on the driving test are spot on . 1 issue is question asked well pupil driving asking to thing of an answer ! Can we make sure this question ask not near to a junction and if pupil prefer to not to answer not to be repeated . It will coz pupil to drive safe. I find it ridiculous that, (A) Let's teach them to park forward and reverse out of a bay because "That's what they'll do when they pass their test anyway" Really? So then shall we also teach them how to safely drive at 40 mph in a 30 zone and drive one handed while smoking, well "that's what they'll do when they pass their test anyway" so why not teach it? Ridiculous ah? And (B) Let's just use private property (Local car parks) to conduct a private, paid for driving test. Have the owners of these car parks been consulted or does the DVSA just feel that it's absolutely fine to just fill local car parks with learners having to practice, without the permission of the land owners? In answer to your first point - we decided to include forward parking in a bay because we wanted to include real-life scenarios. Many people in supermarket carparks drive forward into parking bays so it is easier to load shopping. Please can you create a PDF version of these questions so they can be easily downloaded and shared. Thank you. Over the many years i have been driving, a large portion of which was high-mileage, i have seen many accidents, near misses and road rage caused by parking on the right. Personally i think this should have been outlawed a long time ago and, being a person to live by example, i have not done this since i was in my twenties. Yet you would now expect me to do this if i ever decided to re-sit my test? The vast majority of older drivers don't use a satnav's. Most of them only drive, relatively local, regular routes, e.g. specific (favourite) shops; various clubs; relatives; etc, yet they are now forced to use an item they don't want, certainly don't need and will probably find quite confusing. I take it that these changes were designed to rid the road of older, significantly safer, drivers so that younger drivers will have more road space to allow them to drive even faster. Well done! Bay parking has always been taught to reverse into as its more accurate( front wheels guide the back in) but also safer on pulling out again, to say that the change is to reflect what drivers now seem to do on a daily basis is like saying drivers nowadays often go 40-50mph in a 30mph zone but that's ok because everybody does it! Surly parking in a bay should be taught safety first,i recently had a 30yr old man ring me about driving lessons & he explained that he could already drive but had been banned for 3 years,i enquired about the cause of the ban & he answered with "I was reversing at very slow speed out of a bay & an old lady walked behind his car whilst he was looking left &right to check for traffic he bumped into her at extremely slow speed & knocked her down even the police said it was a freak accident unfortunately she banged her head & died 3 days later! A lot of parking lots in my area are putting up signs saying no learner drivers & speaking to an examiner just the other day had his concerns also. Sat nav for 20 minutes seems a bit too long although i do agree its the norm now & i think it will be a good tool to see how the pupil drives without being given directions from the examiner My concern is that pupils will be tempted to look at the sat nav & not at the road though maybe a shorter time as is the independent drive now? Will the turn in the road and reversing round a corner still be included in the test syllabus? The ‘reverse around a corner’ and ‘turn-in-the-road’ manoeuvres will no longer be tested, but should still be taught. They continue to be part of the national standard for driving cars and the learning to drive syllabus. John, if they're not tested for, then the issue of them being "on the syllabus" becomes moot. By definition, a "syllabus" is a list of subjects to be taught, but you can only know if they HAVE been taught if there is a "test" to assess the acquired knowledge. If they're not going to be tested for, then they will end up not being taught at all. In some cases, they will specifically NOT be taught for any test occurring on or after 4 December 2017. From all the information published, There is no explanation as to what will be the standard procedure if the test route encounters traffic during independent driving. Additionally none of the advice published indicates the density of traffic the candidate will be required to negotiate in order to park on the right side of the road. As is the current practice, if traffic is busy this will be managed by the examiner. In exceptional circumstances, the route will be adjusted without the integrity of the test being compromised. The road used will be a general main road that would be expected to carry light to moderate traffic. There isn't a requirement to have any other traffic around and, if it is too busy, the exercise will not be carried out at that time to prevent any unnecessary delays. When driving forward into a bay would this be to the right or left? Would this be next to another vechicle or between two cars? Parking in a bay will be conducted in a car park where there are a variety of options for the candidate to select a suitable bay. The examiner will avoid car parks where only single bays are available. The candidate will then choose a bay either with or without vehicles on either side. The wording given by the instructor will depend on the layout of the car park - if bays are available on both sides then their instructions will reflect this. The examiner will adapt their instructions if bays are only available in one direction. 1. Is the sound on while the sat nav is on during the non independent part of the drive? 2. If the pupil asks for the sound to be turned off for the independent drive part of the test (your words) how will they hear the directions or are they supposed to follow the sat nav screen only? The sound won't be on during the rest of the test. If the pupil asks for the sound to be turned off during the independent drive, they'll use the directions on the sat nav screen as a visual aid. I am under the impression that it is illegal to pull up on the right-hand side of the road in a number of EU countries and so surprised that you are introducing it into the new format driving test! Another change which was suggested was the introduction of motorway driving in a dual controlled car. I noticed that this new change has not taken place. As many young drivers will travel long way soon after passing their tests it would have been ideal to introduce this change at the same time. Will the DVSA introduce this additional facility in the near future??? While it's desirable that anyone using motorways should have received instruction in their correct use, it's not feasible to require this of all learner drivers. Some areas are simply too far from a motorway for this to be practical and not all learner drivers will wish to take a motorway lesson. When the pupil is asked to park on the opposite side of the road in poor visibility, and vehicle lights are needed, our driver may temporarily be parking without lights ie. white lights facing oncoming traffic, especially headlights. Will this manoeuvre still be carried out in such poor conditions? Pulling up on the right is not a parking exercise. The candidate will be asked to pull over to the right to conduct a manoeuvre rather than parking. As this manoeuvre will be conducted on 1 in 4 tests (or 1 in 3 in DTCs without reverse park car parks) the examiner has the flexibility to choose when the manoeuvre is conducted depending on suitable circumstances at that time. great looking forward to these changes . As an instructor and a very experienced driver and learned how to read maps in the boy scouts. I feel Sat nav is a big step backwards. Most of my pupils get left and right mixed up . They would resort to visually checking sat nav which is as dangerous as a mobile phone in text mode. Secondly is DVSA supplying me with a Sat nav to train myself and my pupils? We want to ensure that new drivers have the best possible preparation for driving on their own after they have passed. Sat navs are now in common use and reflects real life driving situations. Using sat navs should also enable the introduction of better routes, over a greater distance, with more of the test taking place away from side roads. Increasing the independent driving section from 10 to 20 minutes will enable examiners to access higher risk roads, where statistically, new drivers have the most crashes. For example, high speed rural roads, which were often inaccessible due to the need of appropriate traffic signs for independent driving. Furthermore, using a sat nav during this section of the test will encourage a wider range of training, not only preparing new drivers to drive safely on rural roads, but also to manage distractions. DVSA will provide the sat nav for the test, but won't buy sat navs for ADIs for training. It doesn't matter which sat nav you use for practice. It could be a built-in sat nav, mobile phone or stand alone sat nav. It's up to ADIs to choose the product that will works for them and their pupils. Will candidates be asked to pull up on the left, before moving across to the right hand side of the road to perform the manoeuvre, or will the instruction be given while the candidate is driving? The examiner will give the instruction to carry out the manoeuvre while the candidate is driving. Can you arrange that at each test centre a Sample TomTom route is available for download to help instructors explain to each pupil what the Examiners TomTom will show??? We won't be providing a sample sat nav as any device that gives audible directions and a visual active map can be used for training purposes. The Satnav will remain on throughout the test. Test routes are not published and sample routes are not available. How is a SAT NAV giving you verbal Directions any different to an Examiner giving you verbal Directions ??? Are the DVSA aware that the tomtom start 52 asks people to drive across a roundabout. How will this be marked when person on the tests, follows the instructions of the sat nav and drives across a roundabout. Many instructors have voiced concerns be it good or incorrect advice, but the reality is, the people who are authorising these alterations to the driving test, must also be prepared to accept the increase in driver deaths, including the unfortunate driver who was acting within the rules of the Highway Code. I would really love to voice all my concerns and real fears regarding the changes that will take place within the driving test from the 4th of December, however, I genuinely believe no one in authority will read them, analyse them, value their worth and certainly not act on them! Cynicism, or fact? Either way, 'it' will hit the fan on the 4th! I must say, many of the points I have read, from my Instructor-colleagues, are well founded and I concur with many of them. I have to say that I am not in favour of your 'Improvements' to the driving test. Like other comments above, changing the way new drivers are examined with manoeuvres are that are potential quite dangerous, just because that's the way other drivers do it, is no reason to change the test. Drivers where I work (Chichester) completely ignore mini roundabouts, so do you want us ADI's to teach that as well? I think you have forgotten what the name of your department is. It's the Driving and Vehicle STANDARDS Agency. Instead of spending money on a new test, perhaps you could run some advertising campaings to educate qualified drivers on the correct use of indicators as this seems to be another one of those actions that many driviers don't do, and would certainly make a far bigger contribution to road safety and driving standards, than trying to reverse out of a parking bay and trying to move off from the wrong side of the road. I heard this from another Instructor a few weeks ago. Make the test an hour long, and drop the fail mark down to either 12 or 10 minors. If the Health and Safety Executive were responsible for road safety, would they recomend driving into a parking bay? Or parking facing on-coming traffic? What statistics will the DVSA be collecting to demonstrate one way or another whether or not there is a statistically significant difference in the results obtained by those candidates asked to perform independent driving by following road signs and those asked to perform independent driving using a SatNav, and where and when will those statistics be published? Both National and Local government now see cycling as a solution to many current issues including improving the environment by reducing pollution and congestion, as well as improving people’s health. Key to encouraging more cycling is ensuring that cyclists are welcome and equal road users. Key to this is how car drivers interact with people riding cycles. It is a shame that the changes did not include a suggestion from many cycling groups that new drivers are tested interacting with cyclists where they are present in the environment. Observing a driver decide whether or not to overtake the cyclist(s), choosing to remain behind the cyclists(s) if overtaking would be unnecessary, illegal or risky. Should the driver decide to overtake we would expect them to give the rider at least as much space as they would if overtaking a car, and to pass at a speed only slightly faster than that of the rider. Should the driver encounter a cyclists at a place where there is a chance that they may need to swerve to the right, such as when passing parked cars where a door may open or a pedestrian step out between the parked cars, the driver should be observed deciding not to overtake or demonstrate overtaking taking into account the possibility that a rider may swerve right. Similarly when moving through a location where the road narrows, a driver should be observed remaining behind the cyclist. The experience of dangerous and close overtaking will put some people off cycling. Hello, I'm 17 and currently learning to drive. I'll probably only have 1 or 2 attempts at the current 'old' driving test before it changes in December. Does this mean I will have to re-learn how to do the driving test, as I will have to be taught these new skills and forget about the old ones? Or am I expected to learn both driving tests simultaneously? This seems unfair to pupils sitting their driving tests just before they change. Reece, I'm surprised no one has replied to you on this. First of all, December is a long way off, and you shouldn't be thinking in terms of just "having a go". There is no reason why you shouldn't pass first time if you've been trained properly. Just be positive about it and you will be fine. I don't know how many lessons you have had, or what you are like as a driver, but if you're having one or two hours a week you may easily be ready well before December. If it turns out that you ARE taking the new test at some point then again you shouldn't worry. Your instructor should teach you what is necessary, and in theory that will just mean two new "manoeuvres" - neither of which comes even close to reversing around a corner in terms of complexity - and following directions from a satnav instead of the examiner. Two of the manoeuvres you already know will disappear from the test. In all honesty, if you hadn't seen this story then you'd would hardly have realised anything was changing unless your instructor was making a song and dance over it to you. The main concerns are for instructors. You haven't got to "unlearn" anything. DVSA says that instructors should teach everything exactly as before (including the manoeuvres which will no longer be tested) and then tack the new bits on. The reality is likely to be that many instructors will quickly start teaching only the new manoeuvres - so you'll actually be a better driver than those who learn in future who will likely not be shown the old manoeuvres at all. The syllabus for learning to drive is not changing and, as a learner driver, you should not be taught how to pass a driving test, but how to drive safely and competently to ensure a lifetime of safe driving. The skills that you are taught will be assessed on the new test as well as the current test but, as all driving tests will be the new style after the 4th December, then it is essential that you are prepared. If parking forwards into a bay is selected by the examiner, will the candidate be directed to a car park and told to drive forwards into any bay they like, or will they be directed around the car park and told to drive forwards into a specific bay? If so will they be asked to park between two cars or will it be a bay that is clear on both sides? Also if parking on the right is selected, will the candidate be told where to park on the right and reverse for 2 car lengths, or will they be told to "pull up at a convenient spot on the right"? With the pull up on the right, the candidate will be asked to pull up on the right when it is safe rather than at a safe place. This is a manoeuvre rather than a normal stop exercise and the location that is chosen by the examiner will allow ample opportunity for the candidate to select when they think it is safe to move across to the right. If it becomes apparent that the opportunity to pull up somewhere suitable no longer exists then the examiner will control this situation with the possibility of aborting the exercise and choosing another location later in the test. Thanks for that Chris. It all seems perfectly fine to me and does seem to reflect realistic driving in today's times. As a retired Driving Examiner I am appalled by some of the nonsense put forward by the DVLA , the driving test in my day was quite fair and worthwhile, especially as it was a test to assess the drivers suitability to drive safely, and above all then to gain experience and learn to drive and improve. We had plenty of dual carriageways for candidates to drive at speed which was the same for motorways and above all was FAIR. Yes, advanced driving skills including IAM still mean that I am still learning. Much of what I have read here will not help but hinder matters. How interesting to read the comments of many cynical driving instructors who seem to reject any changes from the good old days when they learnt to drive. I think the DVSA should be applauded in trying to make the test more relevant to todays driving environment. I don't own a sat nav but have used them. I think it would be useful if it was emphasised that sat navs are designed to give directions, and any other information they give, for instance the speed limit should be regarded with some cynicism as they are not always correct. Also that some of the directions they give can be confusing, one only has to look at the ever increasing numbers of drivers who drive the wrong way up a motorway because they believe that is what the sat nav told them. On another note are there any demonstrations of the new test being conducted online. I am a licenced driving instructor until 2020, however I am not currently conducting driving lessons for new drivers. If I were to decide to return to teaching new drivers I would like to see something which would allow me to update myself on the new test and tailor my teaching practices to reflect these changes. It does not matter how the DVSA tries to explain or promote the new driving test, if the overall concept is viewed to be negative by so many people. The statement "Making The Driving Test More Reflective Of Real Life Driving" is very commendable. However such a bold statement should not be seen to include or to be encouraging what could be viewed as a RISK or DANGEROUS situation. I feel it to be quite in order to suggest that regarding any proposed changes that safety should be paramount. Over the decades the DVSA have forced through changes . These changes are not progress, in fact I think that it is a giant step backwards. It is already generating despair with both ADI/s and examiners. 1---Extending the independent drive----Good idea. 2---Introducing Sat Nav---Totally unnecessary, They should not need a gadget to drive. 3---Bay Parking out on the road---Big problems in finding a car park where you would not be asked to leave. 4---The right reverse--- Totally unnecessary, both Risky and could be very Dangerous. Expect to see car insurances increase substantially. I have always promoted good sensible safe driving to send learner forward. I feel that this New Test is encouraging trainers to deviate away from such good standards? As many agree, it's the attitude of experienced drivers -like tailgating, pulling in front abruptly etc- are putting many ppl in danger. I see many experienced drivers not even indicating at the round abouts. These experienced drivers need to take driving practical tests once in a while to see if they really have standards to drive. It's unfair to expect a learner / newly passed driver to stand up to real world situations while it's experienced drivers who are responsible for bad situations on roads. How can dvsa expect learners to drive with same confidence as of 15yrs experienced? This is nuts and completely unreal. They should strive to make situation better on roads by improving older drivers' attitudes but not the other way round. The main reason for current road situations is experienced drivers attitude. Dvsa should try to eradicate the real problem and root cause for bad road situations. Current dvsa test standards only lead to much worse roads. Hi, I have a pupil who is on the Autism Spectrum. She cannot cope with a sat nav even though we've tried a few times. She gets very agitated by it and swears she will never use one. Will she be allowed to ask to not use it on her test or will there be no choice? The satnav will be used on 4 out of 5 tests, with the remaining 1 out of 5 following traffic signs. The examiner will do all they can to ensure the candidate is not disadvantaged during their test and will control it accordingly. I would suggest that you visit the local driving test manager well before the test date and discuss specific requirements with them so reasonable adjustments can be made if necessary. This was a poll carried out by the DAILY TELEGRAPH NEWSPAPER. In answer to your question about car parks - we cannot produce a list of suitable car parks within certain areas, as the intention on the driving test is to use a variety of car parks over a wide area of test routes. As driving instructors will invariably spend more time in the car park due to having to teach the manoeuvres, we would urge them to not overuse the same car parks and not necessarily use the same ones as on the driving test, as this may cause disruption to customers and car park operators/owners. The notices that will be provided in driving test centre waiting rooms is to offer similar guidance. For the "pulling up on the right" manoeuvre, it isn't clear how close to the kerb they will be expected to be. Will this be clarified when the DT1 document is updated, and when is such update likely to be published? As this is a manoeuvre, the candidate will be expected to pull up and keep reasonably close to the kerb. Will the manoeuvre be performed during the independent driving section? If not, due to time constraints, manoeuvres will have to be performed within a few minutes of the test centre.